Jenn Hearts Make up...: September Favourites! I thought that I would write a short post on what has been my favourite products throughout the month of September. I have a mixture of make up and skincare products that I have been loving this month!! Firstly, what has been my go to eyeshadow palette this month is the Illamasqua Neutral Palette. I have been loving this, and to be honest it hasn't left my make up bag. It is perfect to have when i have needed to make my eye make up into more of an evening look when going out after work and have been using nearly every day!! It has over taken my Urban Decay Naked Palette and will be my go to natural palette from now on. I have a blog post already reviewing how amazing this product is, you can find the link to it Here! Another product that I couldn't be without is my favourite mascara!! It is the Bourjois Volume Glamour mascara in ultra black. I have been using this mascara for ages now , and no matter what other ones i try i always end up going back to this one. I have always love the Bourjois mascaras, in particular the volume glamour as i find it does a great job of making my eyelashes appear thicker and more longer. One of my other favourites this month has been the Illamasqua Loose Finishing power in 010. I love how finely milled the powder is and it smells of a lovely soft vanilla. I love finishing my make up off with this powder as it give a lovely finish and makes my skin feel smooth an soft , it still lets my skin have a healthy glow with out making it look overly matte. It helps to keep my make up last longer as well. I use this regularly when I'm working as well and all my clients have loved it just as much as I do. Sadly mine is near its end so will have to order another one, it is also available in a pressed powder formulation. One of my favourite products that has become one of my monthly favourites is my eye make up remover. 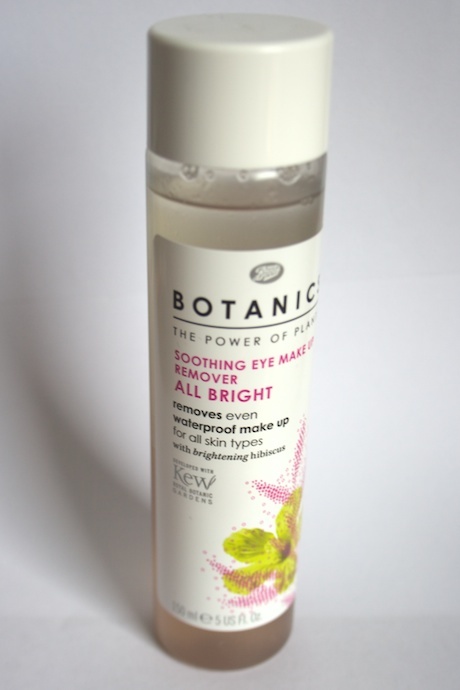 It is the Boots Botanics all bright soothing eye makeup remover. I have been using it religiously since i got it and find it removes my eye make up, no matter how much I am wearing off it , like an absolute dream! To find out more check out my post on it here! With the winter months now coming in quickly and getting colder by the day I have two moisturising products that are taking the edge of the coldness one my skin! Firstly with the season's changing the first thing i noticed was my lips were starting to dry out, so I have started to use my trusty Carmex again and the results are just what I wanted! It has made my lips no longer chapped and smooth again. For my skin I have been loving No.7's Essential Moisture day fluid. It is recommended for normal to dry skin and is hypo-allergenic. I find it is perfect for keeping my skin hydrated as recently my skin has been very dry and dehydrated, but since using this my skin has been great! I think I'm going to end up trying out the night cream in this as well. My favourite fragrance this month has been Escada's Rockin' Rio. I used to wear this all the time when i was younger but it then got discontinued. I was over the moon to see that for this summer Escada brought out three limited edition perfume's from there previous collections and Rocking Rio was one of them. It is a lovely floral sweet scent that is nice and light and not over powering. Its a gorgeous scent for everyday!! If you like fragrances like the Britney Spears Fantasy , Lady GaGa's perfume you will love Rockin Rio.